The famous and delicious Brewster fruit are ready and we are pciking them. The Brewster is the sweetest of all of the lychees. Even more so than the Sweetheart and is along with the Mauritius one of the two commerically grown lychees in Florida. Much of the fruit are ripe or becoming fully ripe and we have begun picking. We expect to have fruit this week and will begin shipping Brewster fruit from our Indiantown grove next week. Of an historical note, the Brewster lychee was the first lychee fruit introduced into the US by the Reverend William Brewster, who was a missionary working in China prior to 1900. Reverend Brewster planted out a grove of these trees right around the turn of the century (1900) along what is now known as Davie extension road in Davie, Florida. From this original planting came the trees that ended up in groves extending into Central Florida, including the Sarasota area and Highlands County. A succession of hard freezes occurring in the early 1960s drove the fledgling lychee industry into the Homestead area of Miami-Dade County. Most of the trees in the original Brewster grove still remain and have grown to enormous size. Please Select Next Day Air or SECOND DAY AIR Shipping unless you are in Florida. If you live outside of Florida please DO NOT select Ground shipping. If you live in Florida feel free to call us and we will arrange for the less expensive ground shipping (954) 648-6020. A Cluster of Brewster Lychee Fruit. In a typical lychee season the trees flower sometime between the middle of January through the end of February. It appears that this is going to be the case during 2018. Ideally, the trees should enter the winter season in a state of dormancy (no active growth flushes). If we experience cool weather (temperatures below 68 degrees F) then there is a good chance that bloom flushes will occur. That is exactly the case this winter as we had many days of cool weather and we are hoping that this will portend a good fruit season, although we will not know for sure until early March as to the extent of the crop. It is always bad luck to predict the lychee crop before the fruit has set. Last year was a terrible year for lychee fruit. Perhaps one of the worst on record. So, statistically, like hurricanes, we are in store for a bountiful year with all of the varieties coming available. The first fruit is generally the Sweetheart, followed close on by the Mauritius and then the Brewster. We may have other varieties available such as the Emperor, Kaimana and Ohia, but we shall see. 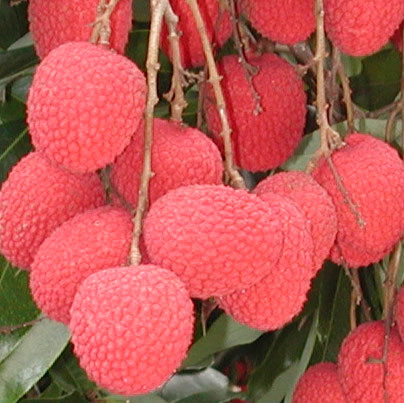 A Cluster of Mauritius Lychee Fruit. 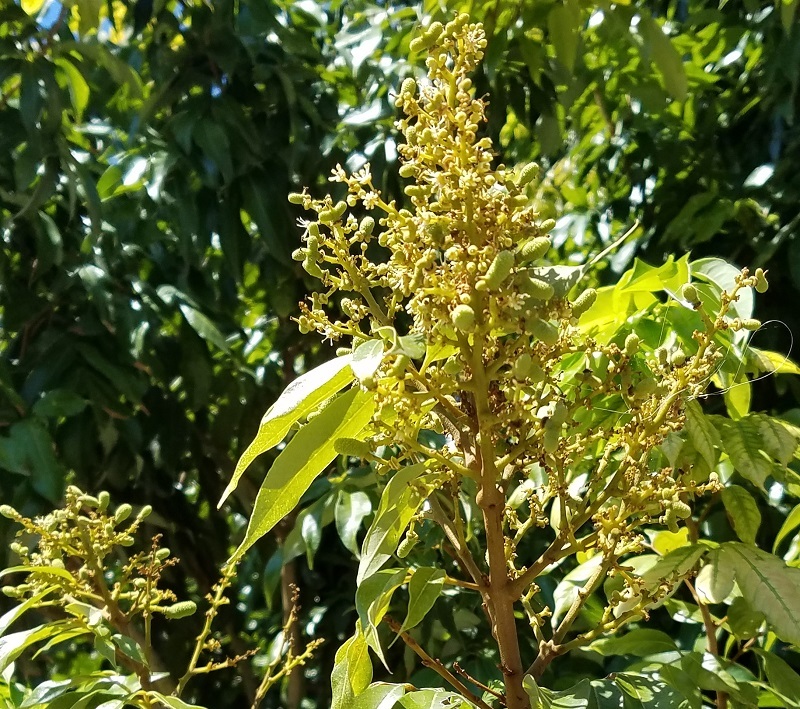 The following video provides an overview of the bloom state of at least Sweetheart lychee trees. From the looks of the Mauritius and Brewster trees the fruit season will witness a smooth continuity of fruit from Sweetheart to Mauritius and Brewster and possibly Emperor and other rare varieties towards the end of the season in late June and early July. The second video demonstrates an example of set fruit that is quite far along. This fruit set at the end of November of 2016. On some years this sporadic early bloom occurs and results in fruit which is ripe from early to mid May. It appears as though we will get some of this early fruit. The accompanying photo shows a closeup of such a bloom panicle with set fruit. I will be available to consumers and growers this season for advice, unlike last year when I was in India for 5 months and unable to adequately follow up on questions and support. Unfortunately, where I was living in Tamil Nadu province in Southern India I did not have the opportunity to sample local lychees, only rambutans, mangosteens and Jack Fruit. While these are all great tropical fruits, even fresh mangosteens, reputed to be the “king of all fruits?do not hold a candle to a freshly chilled, properly ripened Sweet Heart lychee fruit. According to the March 2017 issue of Life Extension Journal Lychee fruit can play a significant role in reducing oxidative stress, inflammation and lower cortisol levels. Increased levels of cortisol can contribute towards the aging of internal organs and the overall appearance of aging. In addition elevated cortisol can lead to higher mortality rates and enhance the risk of diabetes, cardiovascular disease and other neurodegenerative disorders. Lychee polyphenol products contain long contain long chain polyphenols, not easily absorbed in the digestive system. A proprietary process has been developed which reduces the polyphenol molecule chain size, which makes the compound far more bio-available. Studies have shown that participants had significant decreases in cortisol levels and well as that of the inflammatory cytokines IL-1 beta and IL-6. Read Article. Lowering cortisol can be very helpful in controlling obesity, hypertension, blood sugar, bone density and neurodegeneration. Lychee derived oligonols may contribute to this objective and we will continue to keep you informed of the latest dietary advances associated with anything Lychee. In this short video Bill provides four early updates (One in late February, the second in mid March, the third early April and the fourth in Mid May) to the 2018 Lychee Season and explains the state of the bloom. In the short video Bill provides a tour in the Sweet HeartTM grove and demonstrates how to eat a Sweet Heart. Many lychee enthusiasts have requested a tutorial on how to propagate lychee trees via the method know as "air layering" or marcotting. Air layering involves stripping a circumferential section of bark from an appropriately shaped branch and applying an enclosed container of rooting material, generally sphagnum moss. Within the air layer the exposed edge of cambium begins to differentiate into lateral roots. After about 8 - 10 weeks this container is full of roots and is capable of surviving independently as an individual tree when removed from the parent. The following video demonstrates how this first step in propagating a lychee tree is easily accomplished. To view this tutorial click on the following link https://youtu.be/_381-2CKdAA. 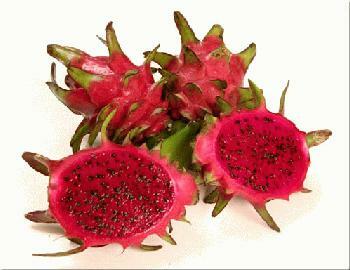 For the first time we are offering Dragon Fruit (Hylocereus undatus). Perhaps many of you have observed this fruit for sale in the specialty fruit department of some supermarkets. A dragon fruit is a form of tree climbing cactus that has a beautiful night blooming flower. The flower resembles the head of a dragon when in full bloom and for this reason the "dragon" name. There are many varieties and the fruit is very attractive and delicious. Dragon fruit is high in fiber, low in fat, high in antioxidants and is purported to have many other health benefits. 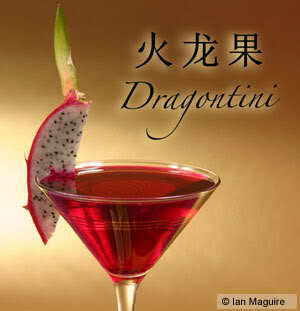 By the way it also makes a famous "Dragontini"
Dragon Fruit and cross section. Past experience has taught us to be very careful in predicting lychee or any tropical fruit crops. Expressions like “don’t bet the farm?and “don’t count your chickens before they hatch? are all too true in agriculture and we have learned the hard way many times over so it is that we do not want to get overly optimistic. The accommpanying videos show the progression of the fruit from flower to partially developed fruit. It is interesting to note that if one reads old copies of the long defunct Florida Lychee Growers Association journal you realize that most of the lychee cultivation in Florida, during the 30s, 40s, and 50s was in the Sarasota and Highlands County area. A succession of hard freezes in the 1960s caused most all of the lychee tree plantings to move into Miami-Dade county (Homestead). A very similar situation happened to the Florida citrus industry, where a succession of hard freezes drove much of the citrus industry from central Florida further south. There was a point in time , many years ago, where citrus was grown as far north as Tallahassee. 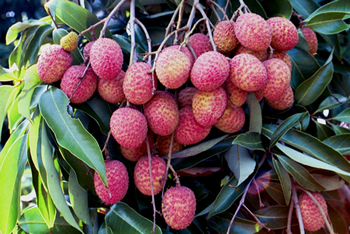 The collapse of the South Florida real estate market and the low prices paid for lychees were two major factors responsible for the disappearance of many small groves in Miami-Dade and Broward County. With the growing popularity of lychee fruit and the corresponding increase in demand for the product, prices paid to growers are improving and we expect this will lead to more extensive plantings in agricultural zones that are changing. Many areas where field landscape or citrus groves were planted are adaptible to lychee cultivation. With vacant land prices low again it is our hope that more serious growers will emerge. 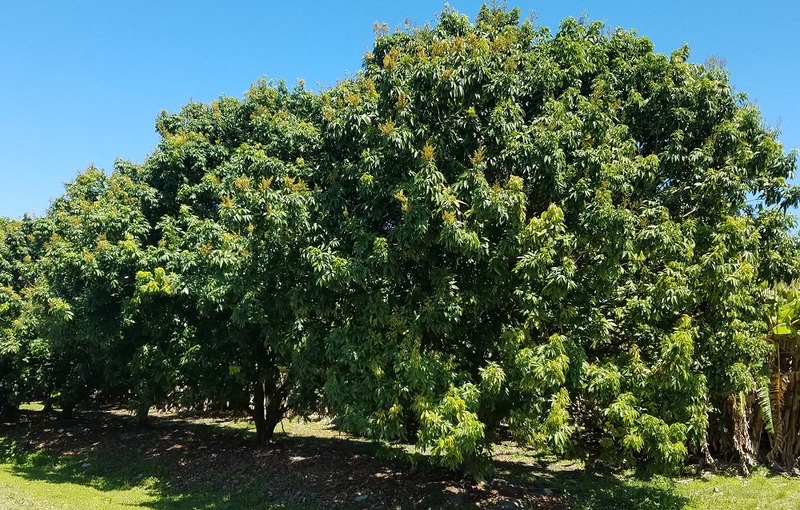 One of the major challenges facing anyone who wants to start a lychee grove is the capital investment and relatively long time required to reach financially sustainable production levels. It takes at least seven (7) years before the trees come into full production. This is Florida and seven years is a lifetime when one considers the various kinds of natural disasters that can occur. Hurricanes, hard freezes, floods, pestilence, low prices, accidents etc. are among some of the natural challenges that present themselves to prospective growers. Still, when your first crop materializes it is a great day and all of the years of waiting are worth it. The upshot of all this is that if you plan to grow lychee fruit you really need to have more than one tree. Even in some of the bigger northern groves there was only about 20% fruit set. I usually recommend that prospective growers plant out two of each fruit variety to insure production throughout the 6 ?7 week season and it is a well known fact that lychee trees set more fruit when in the presence of other varieties. This is especially true with regards to Mauritius lychees. I still continue to hear a very common question: “Why didn’t my lychee tree bloom this year. This is the third year in a row. What am I doing wrong?? The answer to this is a bit counter-intuitive. I often tell fellow growers that the trees in our grove that fruit every year, fruit every year. What does that mean? Trees which produce fruit get “pruned?when the fruit is picked. Lychee fruit is harvested with a pruning shears as one usually clips a panicle from the terminal end of a branch several inches below the beginning of the panicle base. This induces a growth flush which in turn sets the growth flush clock to a known period of time, thus increasing the probability that the trees will enter the winter months in a state of dormancy so that if there is a cold spell when buds are beginning to emerge the buds will morph into bloom spikes. Even if your lychee tree produces no fruit any given year you should always prune it post harvest. The middle of July is a good time for this activity. In areas where lychees are grown commercially this process is often accomplished with a commercial hedging machine such as what is used to hedge citrus trees. The Brewster bloom this year is modest. The bloom this year came in mid January through mid February, and the fruit is repining normally. It typically, requires about 90 days for the fruit to mature once the fruit has set. That being said I would expect this Brewster fruit crop to become available in mid June. Our Sweetheart trees put out a moderate bloom this year as a result of the cool days in January and February. A recent study conducted in Japan at the Department of Medical Management and Informatics, Hokkaido Information University, concluded that a low molecular weight polyphenol (Oligonol) from lychee may reduce abdominal fat in people with metabolic syndrome. View Recipe and Preparation Procedure - - Master Chef Peter Krause has created a marvelous recipe using fresh lychee, grouper and chile. The recipe is brilliantly illustrated in painstaking graphic and audio detail. In all of our years of collecting and compiling recipes, that incorporate lychee, we must flatly say that this is the very best yet and sets the platinum standard for lychee cuisine. Come and feast your eyes and palate on this masterpiece. We convey our enthusiastic gratitude to Peter for sharing his recipe with those of us who love lychee. 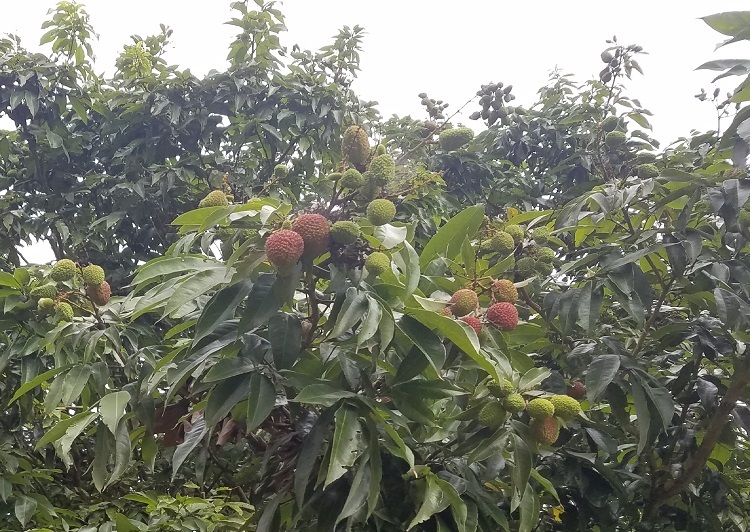 Learn the Particulars about Lychee Flowering - - Almost every one who grows a lychee tree asks the same question: Why doesn't my tree bear any fruit? This is a common problem with lychee trees and the answer and solution make for an interesting discussion. This article, divided into 5 parts, explains the morphology of lychee flowers and will help both the backyard grower and commercial farmer in identifying essential characteristics of bloom pannicles as well as methods to overcome the reluctance of lychee trees to annually bloom. Our Free Lychee Idea Kit has been updated.